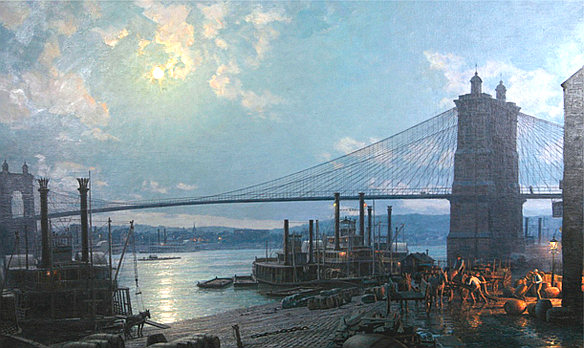 "Cincinnati" by John Stobart. This long sold-out piece is from over 25 years ago, showing moonlight on the Ohio River as viewed from the Public Landing in 1880. An important entry in any Stobart collector's folio...not to be missed. This one is in immaculate condition, hand-signed 678/750. Print image size 19" x 31". Only one in stock. (Requires additional shipping charges for insurance and destination).